Saarbrücken (German pronunciation: , ltz. Saarbrécken [zaːɐ̯ˈbrækən] , fr. 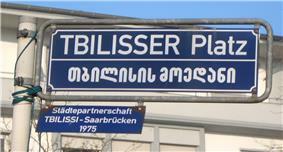 Sarrebruck [saʁ'bʁyk], local dialect Saarbrigge [zɐ̯ːˈbrıgə]) is the capital of the state of Saarland, Germany. Saarbrücken is Saarland's administrative, commercial and cultural centre. 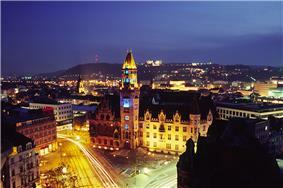 The city is situated next to the French border at the heart of the metropolitan area of Saarland. A minority opinion holds that the historical name of the town, Sarabrucca, derived from the Old High German word Brucca(German), meaning bridge – or more precisely a Corduroy road, which was also used in fords. Next to the castle, there was a ford allowing to cross the Saar. From the 1st century AD to the 5th century, there was the Gallo-Roman settlement called vicus Saravus west of Saarbrücken's Halberg hill, on the roads from Metz to Worms and from Trier to Strasbourg. Since the 1st or 2nd century AD, a wooden bridge, later upgraded to stone, connected vicus Saravus with the south-western bank of the Saar, today's St Arnual, where at least one Roman villa was located. In the 3rd century AD, a Mithras shrine was built in a cave in Halberg hill, on the eastern bank of the Saar river, next to today's old 'Osthafen' harbor, and a small Roman camp was constructed at the foot of Halberg hill next to the river. Towards the end of the 4th century, the Alemanni destroyed the castra and vicus Saravus, removing permanent human presence from the Saarbrücken area for almost a century. From 1381 to 1793 the counts of Nassau-Saarbrücken were the main local rulers. In 1549, Emperor Charles V prompted the construction of the Alte Brücke (old bridge) connecting Saarbrücken and St Johann. At the beginning of the 17th century, Count Ludwig II ordered the construction of a new Renaissance-style castle on the site of the old castle, and founded Saarbrücken's oldest secondary school, the Ludwigsgymnasium. During the Thirty Years' War, the population of Saarbrücken was reduced to just 70 by 1637, down from 4500 in 1628. During the Franco-Dutch War, King Louis XIV's troops burned down Saarbrücken in 1677, almost completely destroying the city – just 8 houses remained standing. The area was incorporated into France for the first time in the 1680s. France was forced to relinquish the Saar province in 1697, but from 1793 to 1815 regained control of the region. Saarkran, reconstructed next to William-Henry-Bridge in 1991. After 1815 Saarbrücken became part of the Prussian Rhine Province. The office of mayor Saarbrücken administrated the urban municipalities Saarbrücken and St Johann, and the rural municipalities Malstatt, Burbach, Brebach, and Rußhütte. The coal and iron resources of the region were developed: In 1852, Saarbrücken got a railway connecting the Palatine Ludwig Railway with the French Eastern Railway, the Burbach ironworks started production in 1856, the Saar up to Ensdorf was channeled since 1860, and Saarbrücken was connected to the French canal network. At the start of the Franco-Prussian War, Saarbrücken was the first target of the French invasion force which drove off the Prussian vanguard and occupied Alt-Saarbrücken on 2 August 1870. 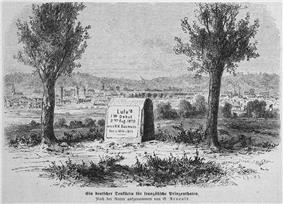 Oral tradition has it that 14-year-old French Prince Napoléon Eugène Louis Bonaparte fired his first cannon in this battle, an event memorated by the Lulustein memorial in Alt-Saarbrücken. The French left Saarbrücken on 4 August 1870 and were driven away towards Metz in the Battle of Spicheren on 6 August 1870. Saarbrücken became capital of the Saar territory established in 1920: under the Treaty of Versailles (1919), the Saar coal mines were made the exclusive property of France for a period of 15 years as compensation for the destruction of French mines during the First World War. The treaty also provided for a plebiscite, at the end of the 15-year period, to determine the territory's future status, and in 1935 more than 90% of the electorate voted for reunification with Germany, while only 0.8% voted for unification with France. The remainder wanted to rejoin Germany but not while the Nazis were in power. This 'status quo' group voted for maintenance of the League of Nations administration. In 1935, the Saar territory rejoined Germany and formed a district under the name Saarland. Saarbrücken was heavily bombed in World War II. The Royal Air Force raided Saarbrücken at least 10 times. Often employing area bombing, the Royal Air Force used total of at least 1495 planes to attack Saarbrücken, killing a minimum of 635 people and heavily damaging more than 8400 buildings, of which more than 7700 were completely destroyed, thus dehousing more than 50,000 people. The first major raid on Saarbrücken was done by 291 aircraft of the Royal Air Force on July 29, 1942, targeting industrial facilities. Losing 9 aircraft, the bombers destroyed almost 400 buildings, damaging more than 300 others, and killed more than 150 people. On August 28, 1942, 113 Royal Air Force planes raided Saarbrücken doing comparably little damage due to widely scattered bombing. After the Royal Air Force mistakenly bombed Saarlouis instead of Saarbrücken on September 1, 1942, it raided Saarbrücken with 118 planes on September 19, 1942, causing comparably little damage as the bombing scattered to the west of Saarbrücken due to ground haze. There were small raids with 28 Mosquitos on April 30, 1944, with 33 Mosquitos on June 29, 1944, and with just 2 Mosquitos on July 26, 1944. At the request of the American Third Army, the Royal Air Force massively raided Saarbrücken on October 5, 1944, in order to destroy supply lines, especially the railway. The 531 Lancasters and 20 Mosquitos achieved these goals, losing 3 Lancasters but destroying large parts of Malstatt and nearly all of Alt-Saarbrücken. From January 13 to January 14, the Royal Air Force raided Saarbrücken three times, targeting the railway yard. The attacks with 158, 274, and 134 planes, respectively, were very effective. The 8. US Air Force raided Saarbrücken at least 16 times, from October 4, 1943, to November 9, 1944. Targeting mostly the marshalling yards, a total of at least 2387 planes of the 8. USAF killed a minimum of 543 people and heavily damaged more than 4400 buildings, of which more than 700 were completely destroyed, thus depriving more than 2300 people of shelter. Donald J. Gott and William E. Metzger, Jr. were posthumously awarded the Medal of Honor for their actions during the bombing run on November 9, 1944. On the ground, the US 70th Infantry Division was tasked with punching through the Siegfried Line and taking Saarbrücken. 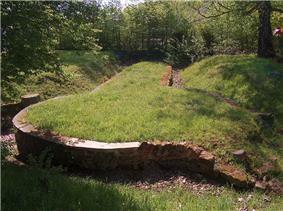 As the fortifications were unusually strong, it first had to take the Siegfried Line fortifications on the French heights near Spicheren overlooking Saarbrücken. This Spichern-Stellung had been constructed in 1940 after the French had fallen back on the Maginot Line during the Phoney War. The 276th Infantry Regiment attacked Forbach on February 19, 1945, and a fierce battle ensued, halting the American advance at the rail-road tracks cutting through Forbach on February 22, 1945. The 274th and 275th Infantry Regiments took Spicheren on February 20, 1945. When the 274th Infantry Regiment captured the Spicheren Heights on February 23, 1945, after a heavy battle on the previous day, the Germans counter-attacked for days, but by February 27, 1945, the heights were fully under American control. A renewed attack on March 3, 1945, allowed units of the 70th Infantry Division to enter Stiring-Wendel and the remainder of Forbach. By March 5, 1945, all of Forbach and major parts of Stiring-Wendel had been taken. However, fighting for Stiring-Wendel, especially for the Simon mine, continued for days. After the German defenders of Stiring-Wendel fell back to Saarbrücken on March 12 and 13th, 1945, the 70th Infantry Division still faced a strong segment of the Siegfried Line, which had been reinforced around Saarbrücken as late as 1940. 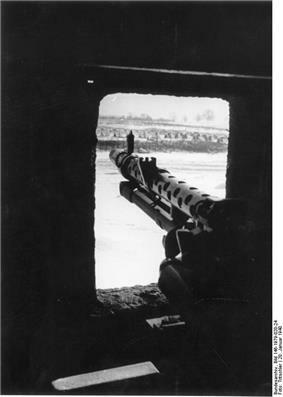 After having the German troops south of the Saar fall back across the Saar at night, the German defenders of Saarbrücken retreated early on March 20, 1945. The 70th Infantry Division flanked Saarbrücken by crossing the Saar north-west of Saarbrücken. The 274th Infantry Regiment entered Saarbrücken on March 20, 1945, fully occupying it the following day, thus ending the war for Saarbrücken. In 1945, Saarbrücken temporarily became part of the French Zone of Occupation. In 1947, France created the nominally politically independent Saar Protectorate and merged it economically with France in order to exploit the area's vast coal reserves. Saarbrücken became capital of the new Saar state. A referendum in 1955 came out with over two thirds of the voters rejecting an independent Saar state. The area rejoined the Federal Republic of Germany on 1 January 1957, sometimes called Kleine Wiedervereinigung (little reunification). Economic reintegration would however take many more years. Saarbrücken became capital of the Bundesland (federal state) Saarland. After the administrative reform of 1974 the city had a population of more than 200,000. From 1990 to 1993, students and an arts professor from the town first secretly, then officially created an invisible memorial to Jewish cemeteries. 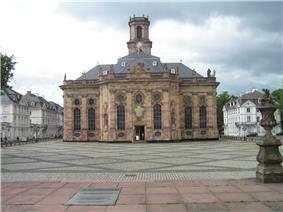 It is located on the fore court of the Saarbrücken Castle. On March 9, 1999 at 4:40am, there was a bomb attack on the controversial Wehrmachtsausstellung exhibition next to Saarbrücken Castle, resulting in minor damage to the Volkshochschule building housing the exhibition and the adjoining Schlosskirche church – but not causing any injuries. Furthermore, Saarbrücken houses the administration of the Deutsch-Französische Hochschule, a French-German cooperation of 180 institutions of tertiary education mainly from France and Germany but also from Bulgaria, Canada, Spain, Luxembourg, Netherlands, Poland, Great Britain, Russia and Switzerland, which offers bi-national French-German degree programs and doctorates as well as tri-national degree programs. The Saarland University also has a Centre Juridique Franco-Allemand, offering a French and a German law degree program. Saarbrücken also a houses a Volkshochschule. Hannelore Baron (8 June 1926 – 28 April 1987), collage and assemblage artist, emigrated to United States in 1941.